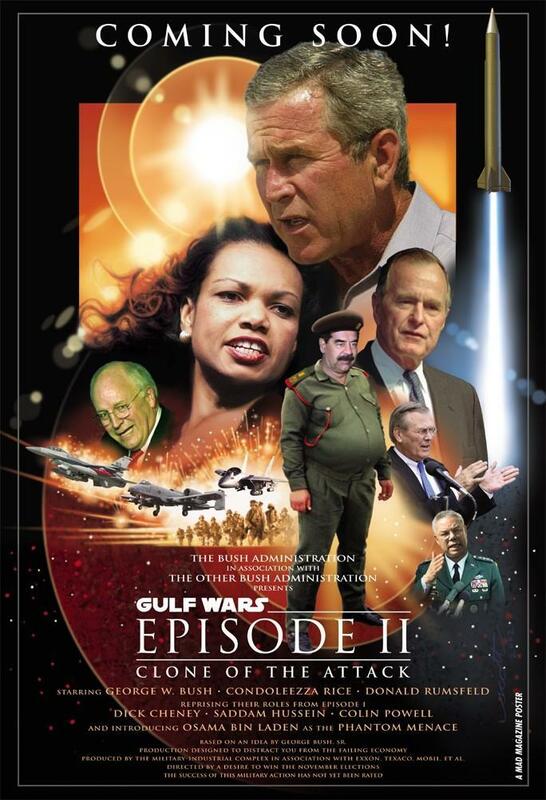 Here are some of my very disorganized thoughts about Gulf War II which started last friday. I have links also to Robert Byrd's speech on the floor of the Senate and Robin Cook's resignation speech from the UK House of Commons. Both speeches are excellent and they have my full agreement. I also have republished the Episode II poster. Click on the picture to the right to get the full version. As I have watched and listened to the first days of Gulf War II, I find myself very conflicted. I want the war to be over soon and our soldiers home but I don't want the political right wing to feel like this sort of behavior is relatively painless and can be repeated elsewhere. I have believed for some time that this will not be an easy war to win (especially after watching the movie Black Hawk Down) but for my premonitions to come true, more US soldiers will probably die. It would be easy if Bush, Cheney, and the hawks were the ones out there on the battlefield -- if they took casualties for their beliefs then fine. But when the kids that are getting killed are not the ones who are perpetrating the propaganda and policies I just get depressed. I think that the Bush administration could have had me on their side if they had done a better job of explaining to the world their motivations for this war. Instead they have all but isolated the US and world public opinion is vastly against us. They couldn't even get NATO to agree on a resolution in favor of the US position and countries like Turkey are getting flack for voting their minds and giving us a stiff-arm. Who do we have on our side? Basically just England although I think Australia is sending some troops. For a while it was only England and Spain which prompted Bill Maher to say "When you want to make it clear to the world that you're not an imperialist, the people you want in your corner are Britain and Spain". Indeed. A large percentage of the world's protesters say that the only reason why the US is in this battle is because of oil. I'd like to disagree with this assessment. I think Bush and company seriously believe that if the US goes in there and takes out Saddam and leaves a stable democracy in our wake, that this will have an effect on the entire region -- specifically the other Islamic states without representative governments such as Kuwait, Saudi Arabia, and Egypt. To me this is very much playing with fire and could blow up in our face by even more factionalizing the zealots, however I understand the sentiment. Although I gree that Saddam is a very bad man, I wonder if this is a good enough reason to go to war. Certainly we've supported him in the past when it was in our best interests to do so. When Iran was our mortal enemy we had no qualms giving Iraq military assistance, much like we assisted Osama Bin Laden during USSR's war with Afghanistan. Some say that our old relationship with Saddam means that we have a greater responsibility to fix the transgressions. But where does it stop? If we start trying to fix our mistakes by invading everyone I get the feeling that we will be fighting for a long time and that it will backfire on us in the long run. Are we ready to go from regime-to-regime take out the "bad men" out there. Are we ready to return to Africa? How about Pakistan? I firmly believe that Israel continues to breed new generations of terrorists by its treatment of the Palestinians. If we take the heavy hand, even in the name of "world security", people will pushed to the edge and rage will be converted into more terrorism. If the situation were reversed, I can see myself doing the same thing. If some aggressor took over my country and killed my wife and child, I don't doubt that I would become a guerilla fighter ready to do just about anything to protect my homeland. In regards to those folks who call unpatriotic those who protest against the conflict, I quote Robin Cook, the British Foreign Secretary who resigned last week "It is entirely legitimate to support our troops while seeking an alternative to the conflict that will put those troops at risk." Recently Connie Chung asked Janeane Garofalo "Don't you feel a bit of responsibility in the sense of being supportive of [the soldiers]?" Janeane was representing the anti-war movement which is trying to not get our soldiers killed and she is accused of not being supportive of them. All over I see the "Peace is Patriotic" bumper stickers and I wonder at the American thinking that makes it necessary to point it out. Certainly we need to continue to hold the lessons of the Vietnam War when US servicemen and women came back to a country very angry about the war. Even the soldiers who had been drafted and sent to fight were blamed for the horrors of war. I'd like to think that we will never make the mistakes of confusing the hawks in Washington with the grunts in the trenches. I'd like to encourage you to read the much more eloquent words of US Senator Byrd and MP Robin Cook. Both speeches are excellent and they have my full agreement. This work is licensed by Gray Watson under the Creative Commons Attribution-Share Alike 3.0 License.